… I might add to that shortlist. What do those numbers mean; where might we find authoritative explanations? Somewhere in Apple open source, maybe? nothing like an Apple-provided list of explanations of the commonly seen numbers. it may be sensible to treat some of those error codes as deprecated. Correct Shut Down. Shutdown was initiated, from the OS X Shut Down menu or other shutdown command. This normally does not indicate an issue with your system. Hard shutdown. Check power button. Power disconnected. Check power supply/battery. Most likely it's a hardware issue such as faulty logic board, a video card or RAM. macOs Sierra "previous shutdown cause: -2"? For a full up-to-date list, see Shutdown Causes. See also: List Of Mac OS X Error Codes. -60: What is shutdown cause -60? Bad master directory block (badMDBErr). -62: Kernel: "Previous shutdown cause: -62"
Watchdog timer detected unresponsive application, restarting the system. Possibly linked to battery issue. -108: What is Shutdown Cause -108? Restart cause logged when it freezes in a hard manner. Tracking down hard shutdown cause—software? hardware? overheat? 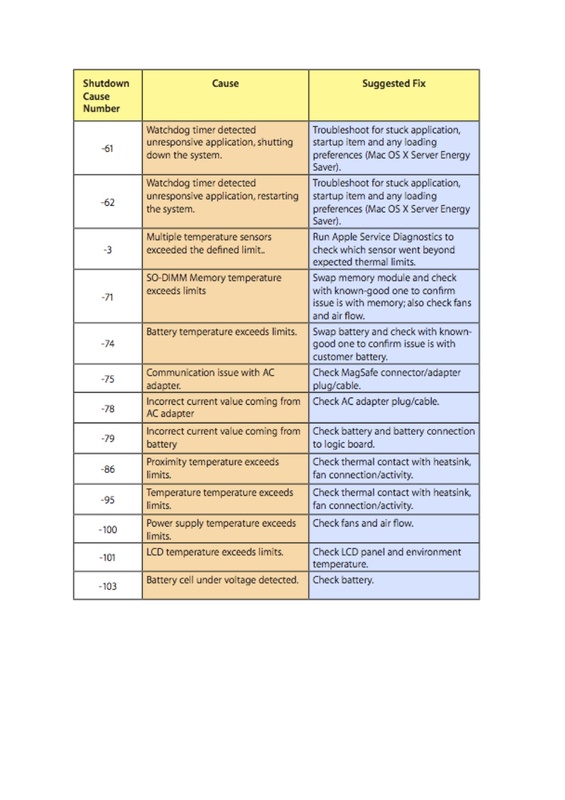 In general, -128 is unknown hardware problem, but commonly it can be related either to memory issue or to the battery time span (at the end of its useful life). If you've got negative numbers very often, Apple is more keen to get your Mac to the repair, as it usually indicates problem with your hardware. Reset the SMC and Reset NVRAM (which you did). Run an Apple Hardware Test. Install EtreCheck app to find serious problems on your Mac. So the kbase articles on System Error codes date back to the days of PowerPC processors, which apparently needed a lot more bits to report all of the potential hardware errors that could cause a shutdown. Starting with the advent of Intel boards, all shutdowns are tagged with an 8-bit code, if the normal software shutdown flags are not recorded. A positive code indicates a software or HID initiated shutdown, while a negative code (in the range of -1 to -127) indicates hardware-related Intel SMC-initiated shutdown. A -128 shutdown code indicates a hardware-related shutdown of unknown cause. file. Unless you happen to connect your MagSafe adapter immediately after the computer goes to sleep, this code is pretty well guaranteed to be followed a 0 Shutdown Cause in the system.log. Some of the hardware shutdown codes are unique to specific models of computer depending on their configuration because they refer to a specific sensor or device that exists only in that model– when I worked for Apple we were told that Intel was responsible for assigning the codes and wasn't particularly free with the information sharing on that count, even with Apple Engineering. So we pretty much had to figure out the obscure ones on our own. Previous Shutdown Cause 5 and 3 are holdovers from the PowerPC days- because they're initiated by the user, the OS is still responsible for reporting them. at the command prompt. Similarly, a Previous Sleep Cause of 5 indicates any clean user-initiated sleep, from the  menu or a hot corner or the command line or closing the lid and triggering the hall-effect sensor in the top case of a MacBook/Pro/Air. Code 3 is a "dirty" Shutdown, which can be caused by any user-initiated Reboot of the computer, or by forcing a hardware computer halt by holding down the power button for 5+ seconds. If your looking for more sleep/wake related info, "pmset -g log" is the place to go, not the system.log everything behaves correctly. If you have questions regarding this resolution, please update your bug report with that information. We are now closing this bug report. In summary: they recommend using the command pmset -g log to diagnose sleep issues rather than looking at the system log. I could help you out with code 0 which means there was no problem, and it was successfully. I have found an old list, from back in 1998 before OS X. It might help you in the right direction even though it isn't quite the exact answer you're looking for. If an errorcode is deprecated it won't be replaced by a new cause, because that would only make it much more difficult to keep track of these numbers used in OS X and prior. 3 Normal behavior... power button was pressed for more than four seconds to force shutdown. Not the answer you're looking for? Browse other questions tagged macos shutdown restart . How safe is Force Restart [Control-Command-Power Button] keyboard shortcut? What is Shutdown Cause -108? What is shutdown cause -60?